Enjoy vacation or just a weekend in beautiful North Conway, NH, USA. Gorgeous White Mountain views, great cabin any time of year. Summer fun, fall foliage, winter skiing or spring shopping, can’t go wrong with this location. It is just off Westside Road and route 302. Only minutes from center of N. Conway’s shops, restaurants and nightlife. Close to Jackson and Storyland, less than 2 miles to The Red Parka Pub or Attitash ski resort and many other ski hills within half hour, i.e. Wildcat, Black, Shawnee, King Pine, Cranmore, Bretton Woods. Very close to the Saco River for kayak or tubing and many hiking trails minutes away. Fully equipped with quality appliances, including gas stove, dishwasher, laundry room, flat screen TV's, all kitchen items, bedding and towels. Great set up with walkout daylight basement games room to fire pit, great patio with Adirondack chairs and amazing mountain views. We are a family of skiers from York Maine who use our Cabin on weekends in winter. Both our daughters are on the Attitash ski racing team. It's truly our second home and we hope you enjoy it as much as we do. We did a full interior renovation of the cabin and continue to budget for annual projects. It is furnished with quality appliances and plenty of furniture better for comfortable stays and years of enjoyment. The hearth gas stove and the kitchen gas cook stove are top shelf units for your use and enjoyment. It took us 3 years to find this cabin. Our wish list was a big one but we found a perfect location with big views and privacy but still quick access to town on all paved roads. We also think North Conway is one of the most picturesque towns with so much to do and great Ski the East mountains all around us. The views will not disappoint and the comfort will completely relax you. You will truly enjoy the surroundings and location for memories of a great time. Two floors of living space with a master loft and full bathrooms on both floors make for a great set up. This chalet allows for 2 separate zones when privacy is needed for naps or whatever. Bathrooms are fully supplied with towels, hairdryers, mirror, and toiletries. Various ranges and Mount Washington all around the village. Close to picturest N.Conway and Jackson. Lots of shopping, restaurants and nightlife. Saco river for lots of canoe, kayak and tubing. 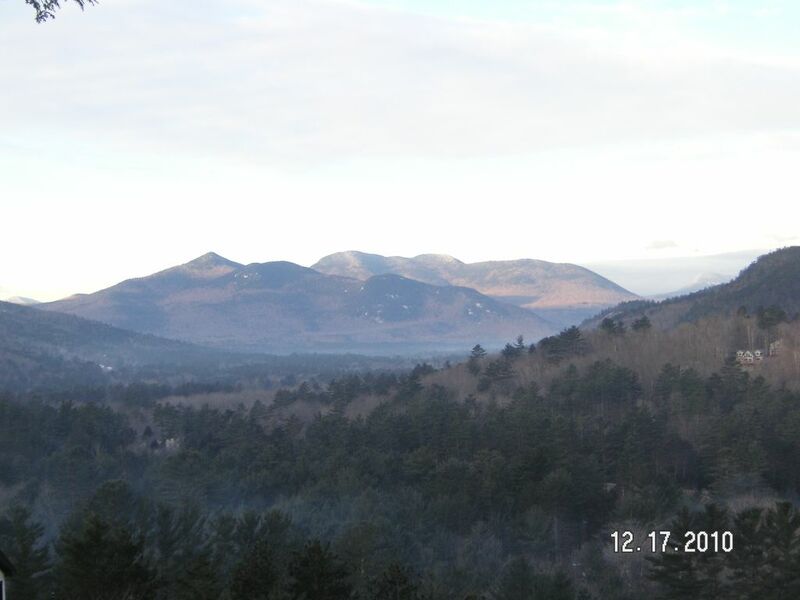 Gorgeous views of White Mountains and the Valley with Attitash/Bear Peak trails. No landline but excellent cell service at that location. large wall unit that cools all cabin on any hot summer days. all included. sheets, comforters, etc. Gorgeous Gas stove that looks like real burning fire as noted under Fireplace. Convenience of the touch of a remote control! part of main room upstairs and another seating living room with 50 inch smart TV downstairs. great added feature, who wants to do dishes on vaca. Part of main room and fully equipped with large island seating section that has 6 stools. All appliances are high quality in stainless beautiful and clean. table in main room pulls out on both sides to seat max 10 guests. Two at each end and 3 on each side. Plus 6 stools at island top which is nice to separate kids and adults for eating when need. Two TV's, one main room and one downstairs. large deck with perfect sunsets. Once you come see it you will want to come again. If we are missing something, please let us know. We try to provide an awesome chalet for rent at a very reasonable rate! Very nice house that was great for a family ski vacation. There is both an upstairs and downstairs living/family area, so plenty of space to hang out and socialize after a day of skiing. The kitchen was well equipped with everything we needed for cooking a meal. The location is super convenient to Attitash and North Conway area. The house was very clean and the owners were very responsive for any questions that we had. The view was as advertised, really pretty mountain views! And there is a beautiful deck to sit on and enjoy the view with a nice cold beer after skiing. I would definitely stay here again. This house was exactly what we were looking for… beautiful, private, view location; affordable (not too much more than a condo); warm and cozy; older/rustic — but very well-kept; well-appointed (not lacking for any amenities). The weather was not the best while we were there, but watching the changing weather over the mountains almost made up for it. We were so comfortable we extended our stay! Although there were just two of us, plenty of room (and for a larger group, plenty of sleeping accommodations). The owner was very responsive and obliging. All in all, a pleasure to work with during our stay. Thanks Terry! - Look forward to returning! Great location and a beautiful house to stay in! Magical and cozy... the perfect vacation spot! Words (and even photographs) can’t capture the setting... it is truly magical! Inside is warm and cozy... homey and welcoming! Perfectly located, close to North Conway, just down the road from the White Mountain National Forest... and although we didn’t ski (September visit), the house is a stones throw from several mountains. We will definitely return! And did I mention the views? Breathtaking! we really enjoyed our stay here. Perfect place for family and awesome view from deck. Enjoy a vacation or just a weekend. Gorgeous White Mountain views, great any time of year. Summer fun, fall foliage, winter skiing or spring shopping, you can’t go wrong with this location. Only 6 miles from center of N. Conway’s shops, restaurants and nightlife. Close to Jackson, Storyland, Red Jacket WaterPark and Skating. Less than 1 mile to Attitash ski resort and many other ski hills within half hour, i.e. Wildcat, Black, Shawnee, King Pine, Cranmore, Bretton Woods and Loon. Very close to the Saco River for kayak or tubing and many hiking trails minutes away like the beautiful Diana's Baths.